RepairBASE by Bluebook provides a national "cost to repair and maintain" data standard and property solution for the preservation of bank owned and managed properties. Our solutions enable seamless integration via XML, API or stand alone systems. Our simple to use, intuitive online tools will enhance inspector productivity and deliver consistently accurate estimates and reports. RepairBASE enables the seamless delivery of detailed, itemized lists of repairs and maintenance costs to your client based on our proven Nationwide Data standardized labor and materials cost data. The integration of the item by item repair cost data, with trade specific calculators, and online reporting tools allows for rapid generation of estimates even for the most difficult repair jobs. In today's volatile market, it is critical that institutional investors, lenders, real estate agents, and appraisers have a reliable & standardized way to estimate the cost of necessary repairs. With RepairBASE one can easily determine if the property is to be sold "as-is", "as repaired", or held as a rental. With RepairBASE private labeled tools, your vendors can easily facilitate repair estimates both in the field as well as in-house. Once a report is submitted, your in-house QC staff can check vendor's pricing against Bluebook's nationwide cost data localized down to the 5 digit zip code. RepairBASE also includes specific costs for grass cuts, board-ups, re-keys, winterization and many other preservation costs. The RepairBASE cost to repair solution meets or exceeds the FHA/HUD compliance guidelines as a commercially available, online solution for local repair cost estimates including FHA 203k loans. Our internet based solution includes localized labor and material costs. RepairBASE creates quality control check points for outside field inspectors and in-house bids. The RepairBASE cost to repair solution was built to take the guesswork out of quickly and accurately producing repair cost estimates without contractor training. 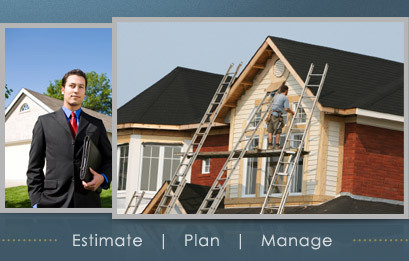 Our internet based solution provides localized repair estimates that includes labor and materials. and Repairs based on a real-world pricing approach.